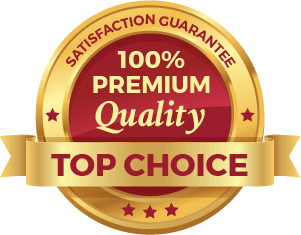 Quality products & services & competitive pricing. 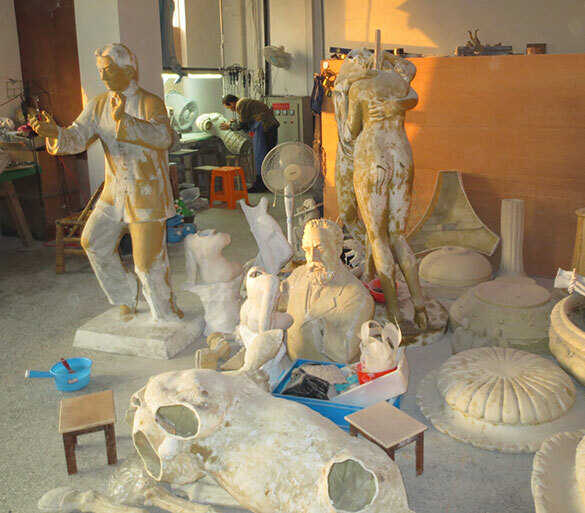 The lost wax method is a method to produce different art subjects like bronze sculptures, statues and also ornamental objects or decoration objects. 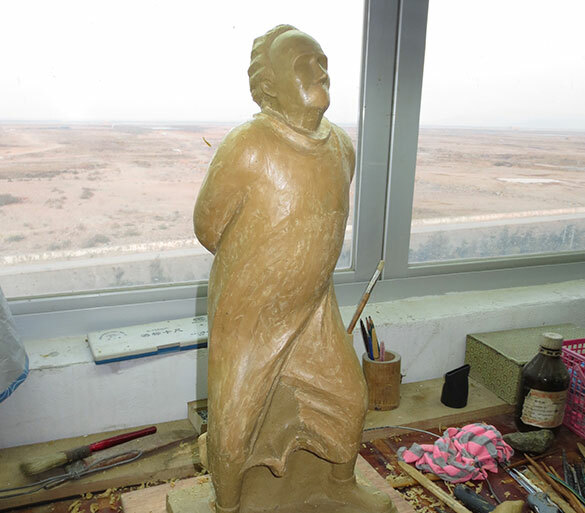 The way of producing bronze sculptures by using the lost wax method is older than thousand years and has not changed yet. This particular handcraft was born 2500 BC, when the first figure was made by the lost wax method. Because the model and the form get lost during the procedure the method is also called “lost mold” or “waste wax process” and the French call this “cire perdue”, what means “lost wax”. Each model is made of melt able materials like wax, in recent years also of synthetic substances. By using the investment casting, in which undivided molds are used, complicated castings can made easily and with high dimension accuracy. Wax is the most used material and also the eponym of the method: lost wax method. This method allows a detailed transformation of the model into the bronze sculpture and guarantees a high level of dimensional stability. The lost wax method is well known since thousands of years and is used in the metal craft since 4000 BC. Bulgaria and Anatolia belong to the important centers of metal processing. The indigenous inhabitants of Columbia and the peoples of Central America also knew this method. Among other things, they used an alloy of gold and copper for making different art subjects and all the famous bronze sculptures of the middle- ages were made this way. The traditional way of producing bronze sculptures has not changed yet and even the well-known “Spirit of Ecstasy” is made by the lost wax method. The lost wax method is popular in contemporary art, because of all the possibilities the method and the materials offer. And even the Dentistry is using this method for producing dentures. At the beginning the artist is making a model of the desired item. At last this item will became the new bronze sculpture. Like already mentioned, the model can be made of different materials but wax is the most popular material. Depending on the desired surface other materials like cast, clay or solidified quicksilver can be used. The material needs a high mechanical load capacity so that the model won’t break down during the procedure. This has a special meaning for the precision casting. There are different kinds and colors of modeling wax, which can be used for making the model. But all kinds need easily to be mold. Afterwards the model is covered with a multilayer and elastic material, mostly with silicone. Using silicone enables an exact copy of the model surface. The next step is the application of three or four different coatings, which can get different colorations (white, gray, black). When the material on the surface is dry, the result is an exact copy of itself as a negative-model. After the silicone is hard, the model gets covered with gypsum because the soft silicone negative model needs to be focused in the mold. The gypsum gets reinforced with sisal or iron, depending on its size. The next step is putting small clay bars on the edges of the shells, where the dividing lines of the silicone have been before. The relief back plate can made out of one part, but is mostly made out of more parts, like two or three. Finally the whole model is covered by the silicone negative- model and gypsum. The next step is separating the gypsum shells and slicing the silicone along the panel seams and the opened gypsum shell sets the model free. After a cleaning, the silicone is put back on the shells. The next step is making the wax model by using the negative- form. Therefore a special kind of wax is necessary. The result is a two or three millimeter thick wax layer. The thickness of the wax layer will be the thickness of the cast. It is important to be carefully by filling in the wax, because small air bubbles could arise. The result is a hollow body of wax: the wax- positive. This model will be the future surface of the bronze sculpture. 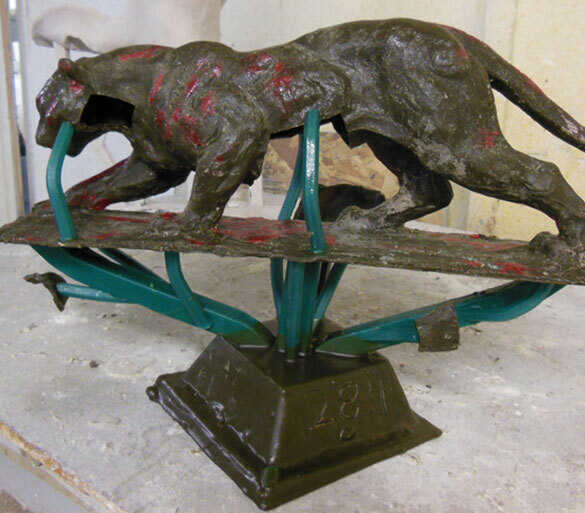 After unwrapping the silicone- negative the wax model gets reworked: seams get retouched and other mistakes get rectified, especially when the original has damaged spots. During the next step the model gets equipped with sprue channels and venting channels. This step is called “cutting”. The sprue channel system is for filling in the hot material and for escaping the air. A high quality cast needs a perfect sprue channel system and the right installation is a question of expert knowledge and destiny. The next step is customizing the proportions of the sprue channel, the barrel and the ingate to the casting. Pins with the function of a centerpiece are plugged in the wax. That means, that these pins connect the centerpiece and the outer shape, when the wax melts down. The number of pins should be low, because the developed wholes of the pins need to be fixed afterwards. A cylinder is build around the model and the cylinder gets filled up with liquid fireclay. The next step is the building of forms of wood or sheet metal with the right size for the wax model. The prepared wax model gets dipped into the liquid fireclay, until the whole model is completely immersed. The fire clay mix consists of recycled fireclay and gypsum. A special machine, a vacuum and water are important for producing this mixture. The mixture must be non-porous and with a smooth surface. 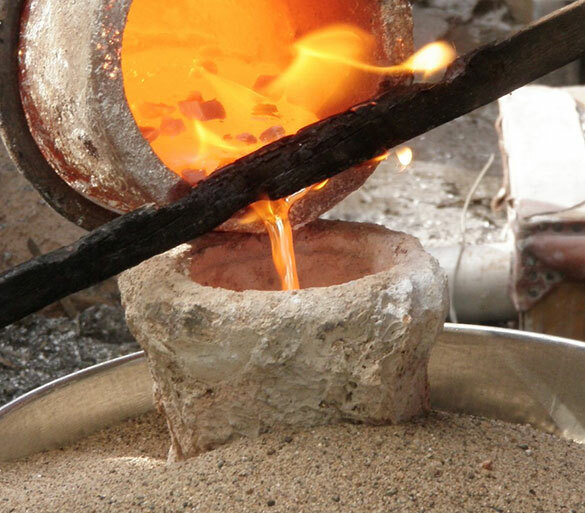 By using a casting funnel the cured fireclay parts get burned for a few days inside an oven, so that the wax can melt and flow out and the void for the liquid metal occurs. Residues need to be removed completely, for example by heating up the temperature of the oven. The wax is melting and flowing out. This procedure is the eponym of this method. The “lost wax” is collected in a channel and can be used again. Meanwhile the temperature rises up to 700° C and is kept, till all the water inside the gypsum is vaporized. The next step is filling of the liquid bronze inside the meanwhile hollow fireclay- shell. 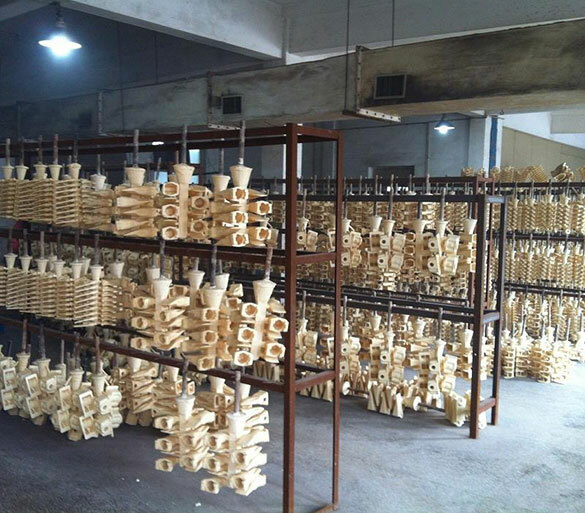 For resisting the pressure of the inflowing material, the burned forms are put in sand filled boxes. The metal is melting inside an induction furnace and afterwards the hot metal (1050-1150° C) will be filled inside the sprue channel. The air escapes through the air ducts and the metal cools down. The high quality of all the process steps will show up now. After the bronze cooled down, the fireclay shell gets smashed and the pins gets cut of and the unfinished casting is visible. Polishing and brushing cleans the surface of the cast and prepares it for the patina. Cleaning the surface with water is also recommendable. The next steep is taking off the pins and the casting system. The single parts get weld together and then the little mistakes and weldings get reduced. The process of reducing the mistakes and repairing the defects is called chasing. The surface of the cast changes by using different techniques like brushing, punching or welding. The casting results of the past have not been as good as nowadays. The chasing was necessary to work out the details. But after reworking the method nowadays exact reproductions can be made easily. The sculpture only gets reworked, if the signature of the artist or the structure of the material gets lost because of casting defects. 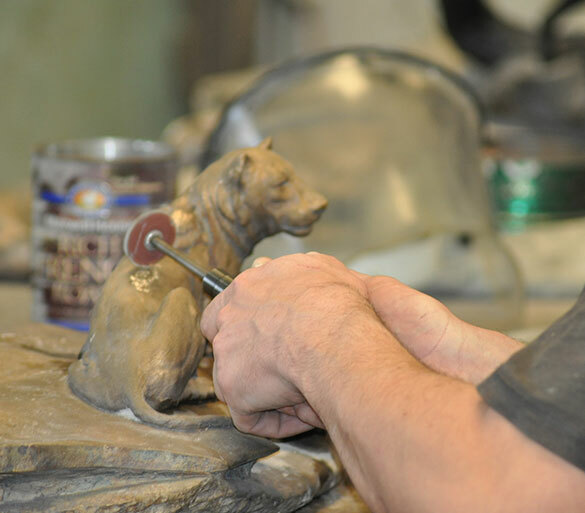 The patination is the last step for giving the sculpture their final look. 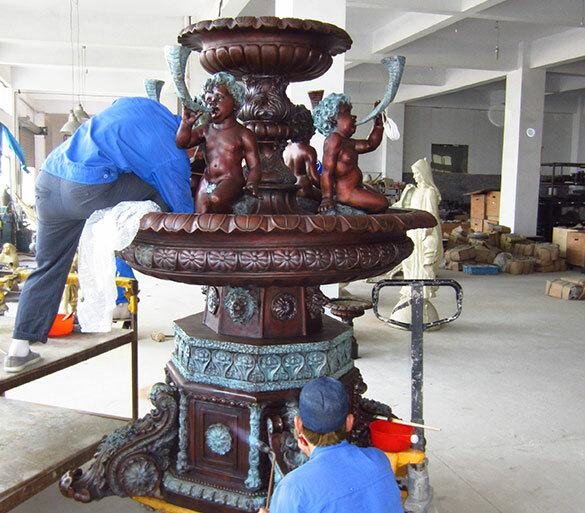 Depending on tastefulness, the patina can be designed in different ways and it can determine the look of the sculpture. Even when the sculpture is supposed to be an unfinished casting, a patination must delete processing marks. During the patination the surface of the model gets manipulated by oxidation and deoxidation. 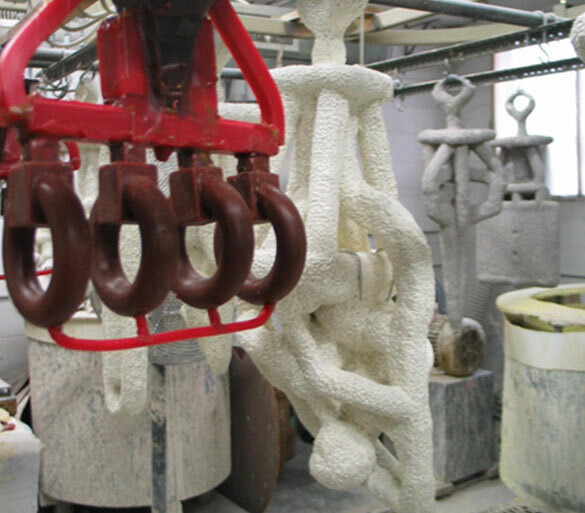 Different and difficult procedures and chemical reactions influence the surface of the sculpture. Copper nitrate, iron nitrate, silver nitrate and hydrogen peroxide are often used. The generated color is the result of the chemical concentration, of the temperature and of the material. The color also depends on the used technique. Popular techniques are using a brush, soft cloth or spray coating. Each technique causes another result and experience is important for a good patination. A thin wax coat can help to conserve the patination. Two different ways of the lost wax method need to be differenced. The first one is a block-shape and the second one is using forms with shell-like structure. The block-shaped forms include all modeling materials with gypsum, like fireclay or brick chippings. The wax models get cut, and afterwards showered with the liquid material or immersed in the liquid material. After hardening the gypsum the forms need to get burned inside the drying furnace, depending on its size for one ore more days. The shell-like structured ones cover the wax model with a fireproof shell. The difference is the modeling. By using the shell-like method the molding material is applied in several steps on the wax. Lay and brick clay is used often. If using the block-shaped method the moulding compound must be liquid. The shell-like method is more economical than the block-shaped method and limited to smaller parts. Filling fluid metal in the form.